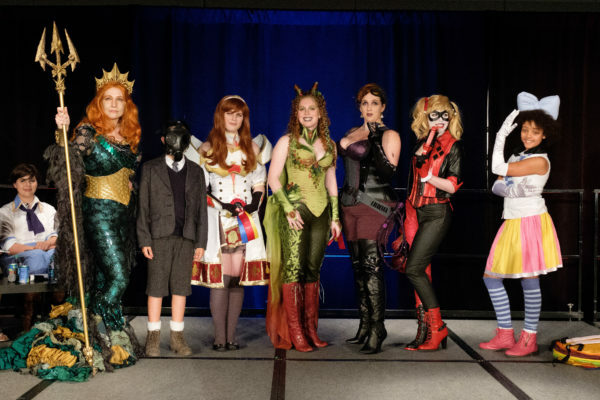 Register for the GeekGirlCon 2017 Cosplay CONtest! 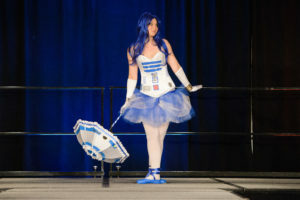 We at GeekGirlCon know every cosplay is a labor of love, which is why we want to give you the opportunity to showcase your hard work and win fabulous prizes at this year’s GeekGirlCon Cosplay CONtest! Cosplayers of all ages and experience levels are welcome to register and reserve their spot for the CONtest on Saturday, September 30 at 4:00 p.m.
We want to see what you’ve put together! 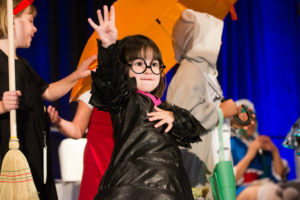 This year the contest will have two age groups: Adult, for adult GGC passholders, and Child, for 12-and-under attendees with child GGC passes. 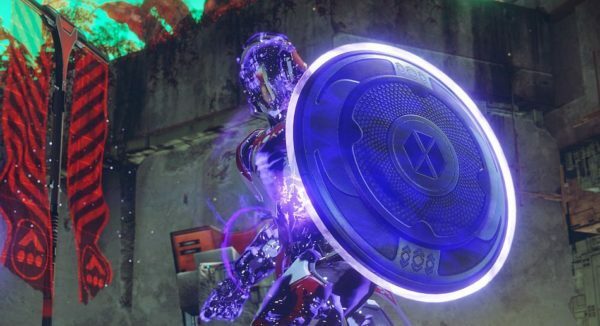 The event will also have a new, masquerade-type format to give everyone more time on stage. Space is limited and entries are online-only, so submit your application early! Registration opens Tuesday, September 5 at 12:00 p.m. Pacific Time and closes when all of the spots are filled, or on Friday, September 22 at 11:59 p.m. Pacific Time, whichever comes first. Get your passes now! Apply to be an Agent! By now I’m sure you’ve all noticed a theme in my updates: plan ahead! As I’ve mentioned before, I love not only the calm but the increased anticipation that comes with making plans early. 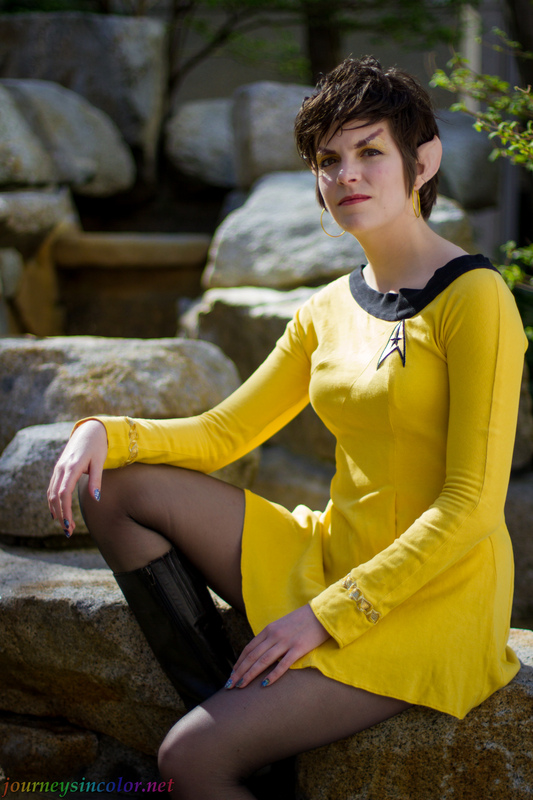 In terms of GeekGirlCon, there’s even perks to prepping in advance. 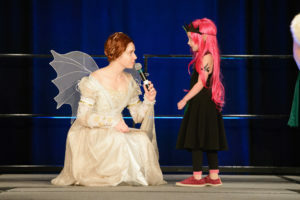 First of all, the sooner you take care of the mundane task of acquiring Saturday, Sunday, or Saturday-Sunday passes for you, your parents, your kids, your friends, and your Dungeon Master, the sooner you can start sorting out the epic costume you’ll be entering in our cosplay competition. Second of all, the sooner you buy passes, the less likely it is that you’ll forget and have to contend with the upcoming price increase. 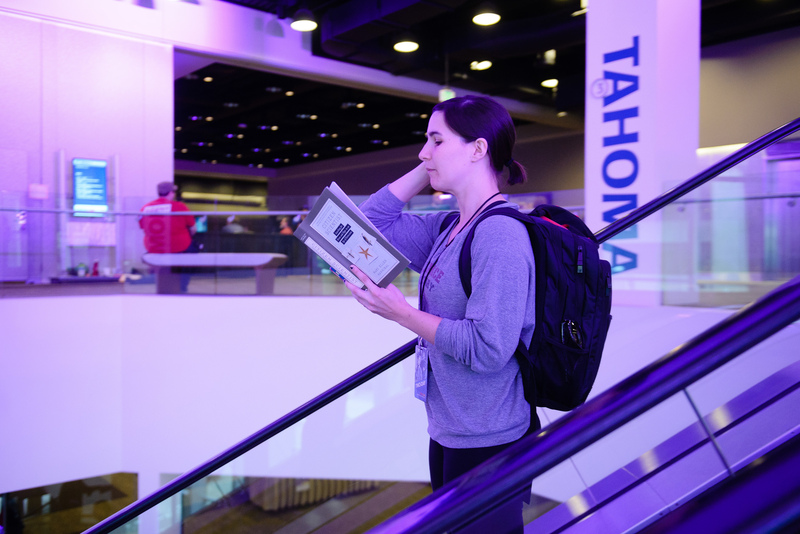 And if you prefer, passes will go on sale in local Seattle stores in late July! 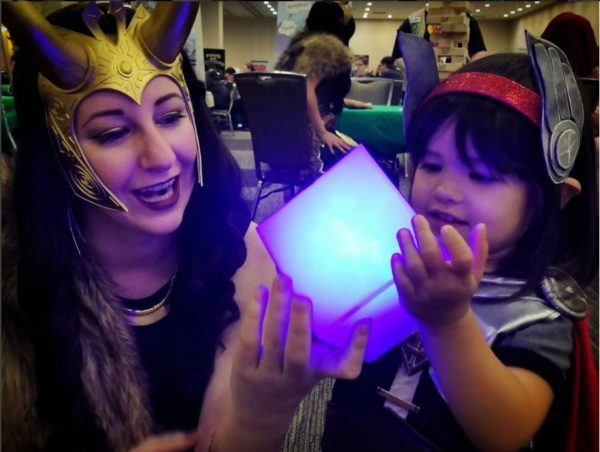 Alternatively, if you’re interested in participating in more of the behind-the-scenes of GeekGirlCon, apply to be an Agent now! 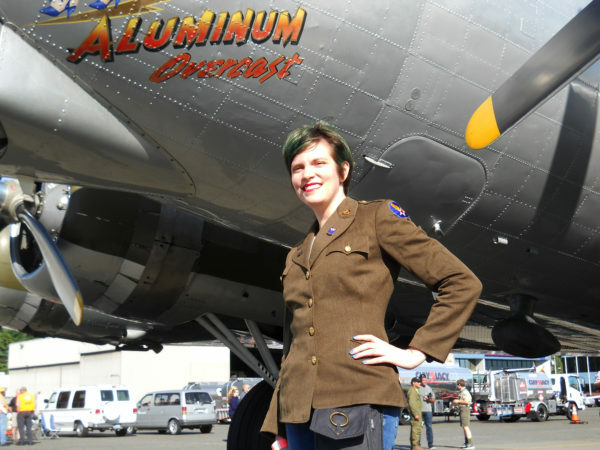 Agents receive passes in exchange for eight to 10 hours of volunteer work during con weekend, which this year will be September 30 and October 1. My mind is blown by all of the imagination and ingenuity I’ve just seen that I’m not sure how to even write a post about it. Thank goodness I have Indigo, my fellow GGC copywriter to help me out! We’ve decided to tag team the writing of this panel to maximize the awesomeness. It was crazy! In no time at all, Adrienne and I were drawn to the pure craftsmanship of the host and judge’s costumes. 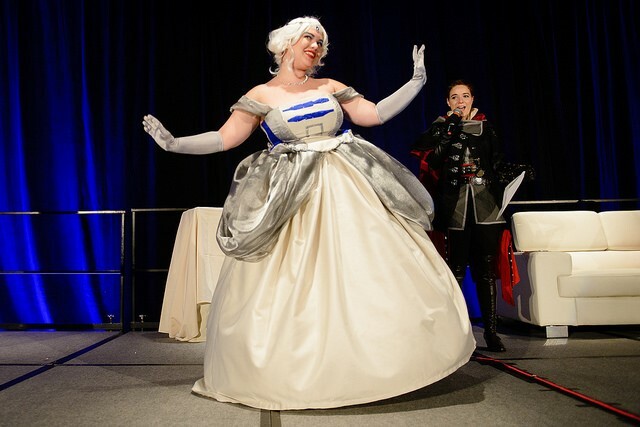 Lauren Bond was charismatic and made for a stellar Evie Frye. 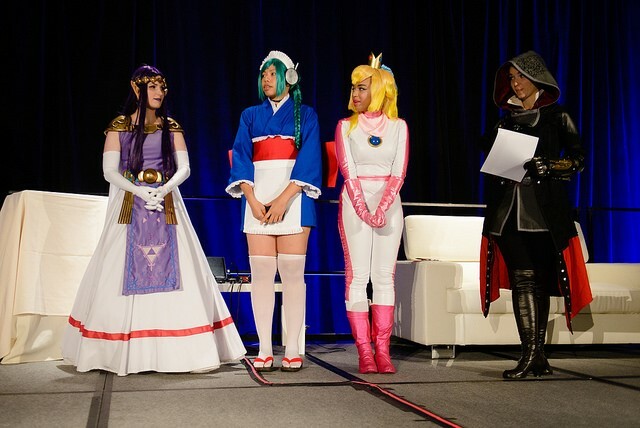 Cheyenne, Priscilla, and Li were no less, dressed as our favorite Nintendo and anime characters. The show started off strong, and only got better as it went on. 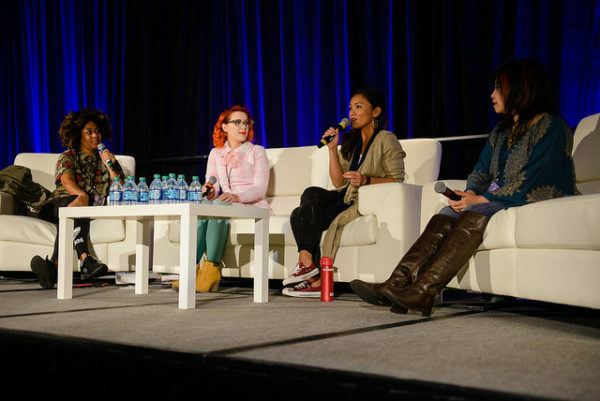 GeekGirlCon ’16 at Washington State Conference Center in Seattle, Washington, on Saturday, October 8, 2016. Photo by Danny Ngan. Since my mind is blown, we’re going to hit the highlights of this year’s contest in an effort to paint a picture of this inspiring event. 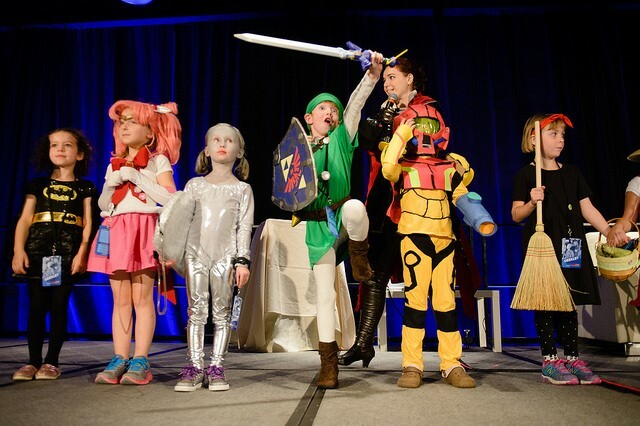 All of the participants were placed into one of five categories: anime, comics, other, film & tv, or video games.